When you visit New England in the fall, you'll be surrounded by gorgeous autumn colors. You'll also be surrounded by... fellow leaf peepers! You can "lose yourself" for a little bit, though—even amid the throngs of fall foliage groupies—at New England corn mazes (see state-by-state directory below). In fact, you may just find yourself begging strangers to give you hints to help you find your way back out! Then again, perhaps you won't be quite as daunted as many visitors are when they venture inside New England's oldest and one of its largest cornfield mazes: the 8-acre Mega Maze at Davis Farmland in Sterling, Massachusetts, which is the centerpiece of more than 50 fun fall activities for families. The Mega Maze pays tribute to NBC Channel 10 in Boston in 2018. The 21st annual Mega Maze is a life-sized, 3-dimensional puzzle that offers visitors all-new challenges. Complete intellectual and physical challenges to find your way or try smartphone-driven options like Mobile Mazing and Geo Questing. In addition to the Mega Maze, the Zip Zone Zip Line, hay bale obstacle course, live bands Friday through Sunday and a petting farm are among the added attractions in the Courtyard this year. All new in 2018: corn cannons, archery tag, adventure laser tag and a paintball shooting gallery. Davis Farmland, a family farm attraction featuring rare livestock breeds and fun activities for small children, and the Mega Maze are located off Route 62 in Sterling in central Massachusetts, just about 20 miles from Worcester. For directions and admission prices and to check dates and hours of operation, call Davis Mega Maze at 978-422-8888 or visit the Mega Maze website. 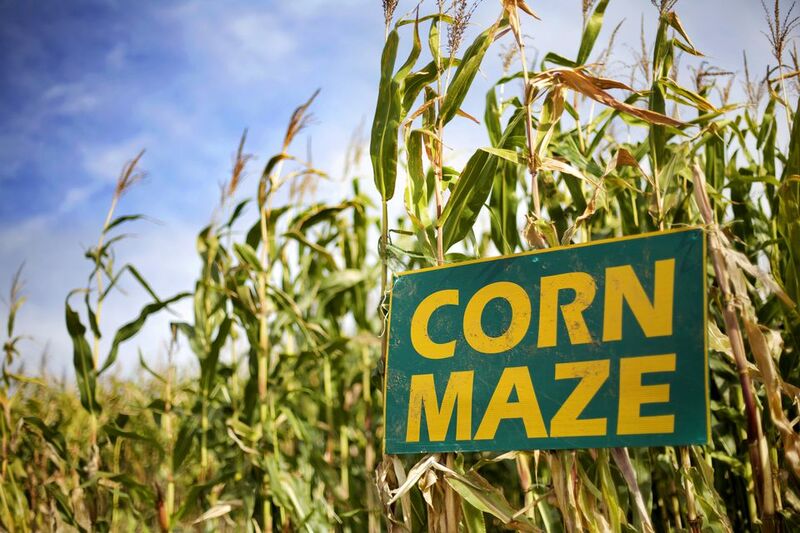 If you'd rather cut your teeth on one of New England's smaller corn mazes before you venture into the Mega Maze, there are plenty of farms throughout the region that have carved mazes into cornfields for the amusement of visitors. An jack-o-lantern theme for 2018 and Night Maze fun on October Saturday evenings (bring a flashlight). 2018's "American Farmer" maze pays tribute to growers. Unicorn fans will love this year's corn maze. Lyman Orchards' corn maze raises funds for the American Cancer Society while celebrating Dancing with the Stars in 2018. This all-ages corn maze raises funds for cancer survivors. Munch on farm-made kettle corn while you explore the 6-acre corn maze. Corn launchers and a corn box (think "sandbox" with corn) add to the corny fun. A small corn maze is among the attractions at this pick-your-own orchard and hard cidery. The ultimate cornstalk puzzle (details above). This interactive maze is most challenging after dark on Friday and Saturday nights. Got little kids? They'll love the "mini maze." 2018's maze is Blackbeard the Pirate-themed, Can you find treasure in the sea of corn? This central New Hampshire corn maze is super difficult by day and haunted on Friday and Saturday nights, when reservations are required. Two themed corn mazes in 2018 including the "Beehive Challenge." Shamrock is the theme of this year's challenge. Rent the maze at night for your group. This year, the maze is apple-shaped. This maze of cornfield paths honors centenarian Marjorie R. Ludlow and the owners' farmhouse, which was moved to its present site 100 years ago. "All About Bees" is the 2018 theme of the Albany area's largest corn maze. Get lost inside two different mazes (one's geared for young kids), especially on Moonlight Mazes nights. 2018's big maze celebrates the 130th anniversary of the first Kodak camera. This year's schoolhouse-themed corn maze was designed by a student. A Giant Corn Maze is just one of nearly two dozen fall attractions at this family farm. Visit Escobar's Web site to print a $1 off coupon before you head to this southern New England corn maze. Arrive by 1 p.m. if you want to conquer the largest corn maze in New England. This three-mile corn maze is two challenges in one.